Derwent® are proud to announce that 2018 will see the world leading art materials brand make their first appearance at the London Stationery Show on stand M422. This annual event will present the perfect opportunity for Derwent® to get their products into the hands of buyers at the cutting edge of stationery. Attendance at the show marks a big year for Derwent® as they extend their product categories and look at new ways to attract a wideremographic of artists. An extended and revamped Derwent® Academy range will get its first outing at the Islington show, with a selection of new product categories that contain the expertise and heritage of Derwent® whilst extending the brand’s aspiring artists collection to a larger consumer base. 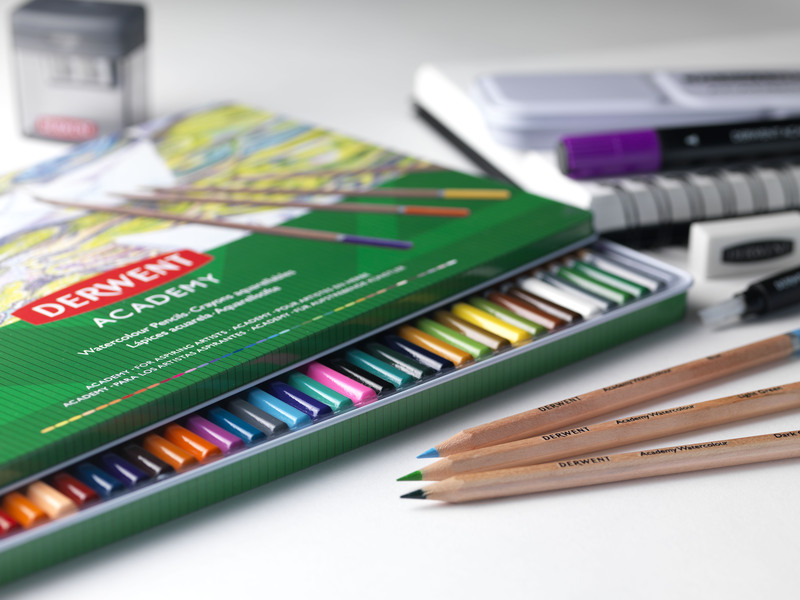 In new-look packaging, the range will now include pastels, paints and markers for the first time. Derwent® Academy products will be complemented by bespoke retail units for a range of eye catching in-store promotions to encourage consumers to trial a new product or attract them to take up art for the first time. Derwent® are on a continual cycle of product innovation and have recently added new products to their professional range including the Derwent® Lightfast range and the Inktense Paint Pan Set which received a highly positive reaction at Creative World in Frankfurt in January. Attendees to the Business Design Centre in Islington on 24 – 25 April will be treated to an art masterclass by internationally recognised artist and writer Jake Spicer, displaying how Derwent® products can appeal to a range of creatives. Mike Stranders, Vice President and General Manager of Derwent Pencils® said: “We’re excited to be a part of the London Stationery Show for the first time. “Over the last twelve months, we’ve continued our tradition of innovation and our product categories have broadened, appealing to a greater number of creatives and artists of all abilities, whilst ensuring that every product contains the quality and innovation expected from Derwent®. The Derwent® team will be available for meetings and product demonstrations throughout the show. If you’re keen to find out more how you can be involved with Derwent®, email Nuala.henry@acco.com.